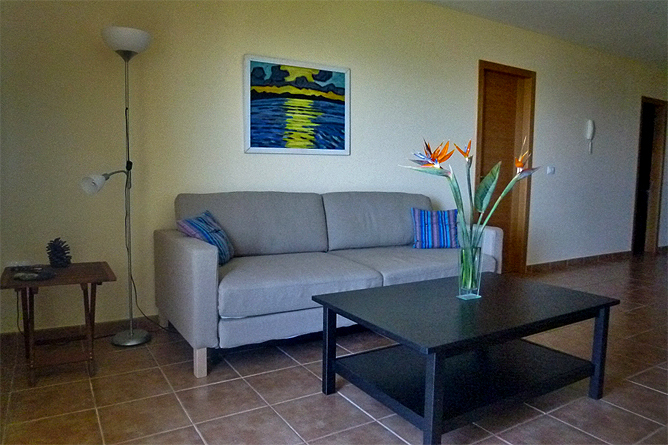 The light and modern furnished Holiday Apartment, situated on the outskirts of the picturesque town Villa de Tazacorte, offers every comfort to enjoy a pleasant stay. The proprietress has turned her attention to high quality furnishing and nice, decent decoration. 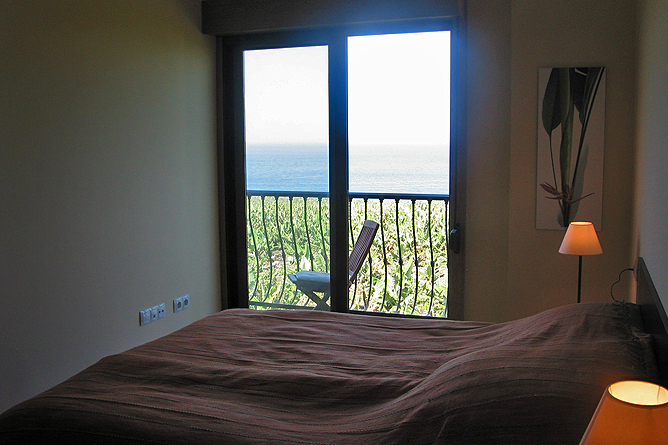 There is a fantastic sea view from inside the apartment as well as from the balcony. 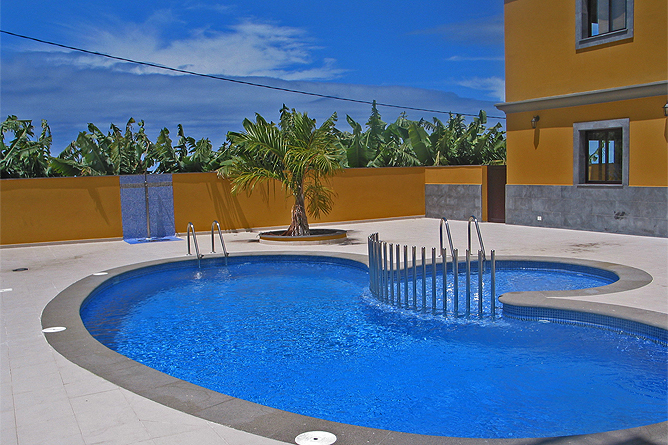 The shared, kidney-shaped swimming pool is located in the patio and is a refreshing delight, especially on hot days. 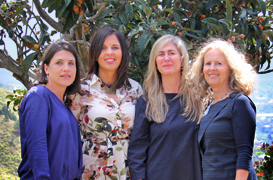 Tazacorte statistically has the most hours of sunshine on the island of La Palma and also offers a pleasant climate in winter. 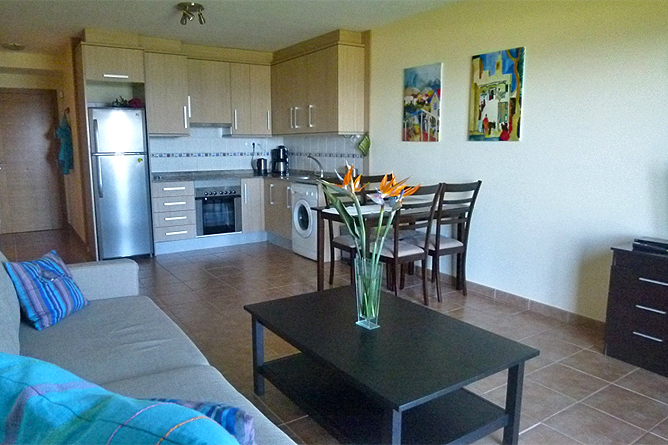 The Holiday Apartment Luz de Palma is located on the first floor of the newly built hillside Apartment House La Palmita. 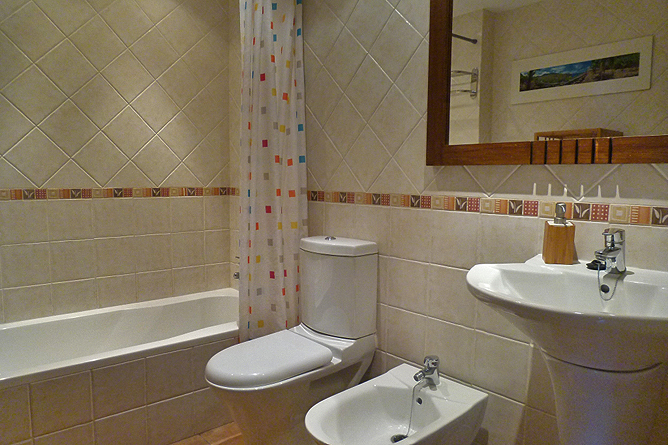 It comprises 44 m² and has a living room, a kitchenette, one bedroom and a bathroom. The living room and the bedroom both are facing west and therefore offer a great sea view from inside as well as from the balcony. 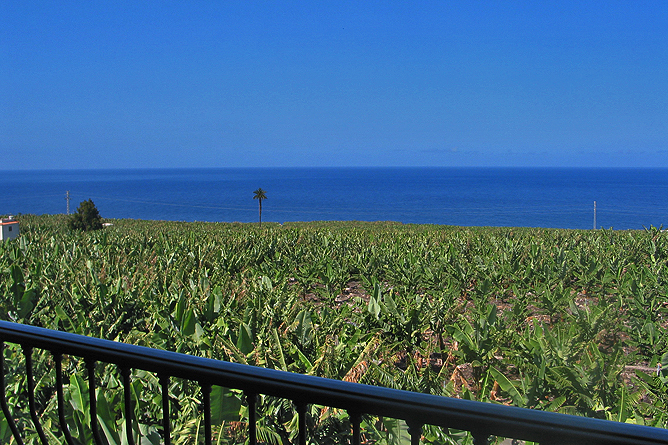 From the balcony you can also overlook the banana fields and enjoy unforgettable sunsets. The kidney-shaped swimming pool has a length of nine meters and an adjoined children’s pool. It is located in the patio, where also a terrace with sun loungers and a outdoor shower are at your disposal. The Holiday Apartment has a modern furnishing. The living room has a sofa bed, a kitchen corner, a dining table with 4 chairs and a satellite TV. The kitchenette is well equipped and has a fridge-freezer and a ceramic hob as well as an oven. There is also a washing machine at your disposal. 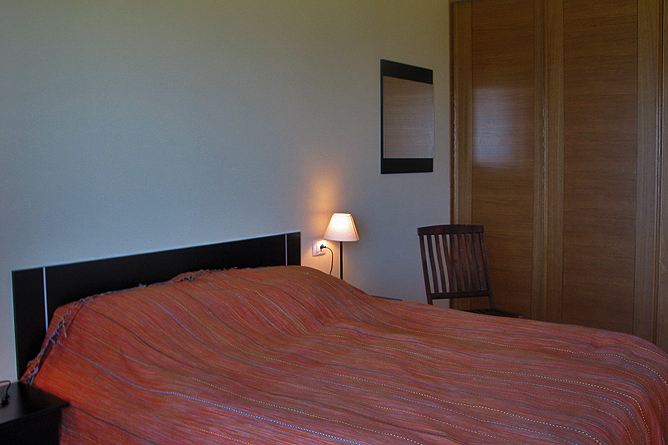 In the bedroom there is a double bed and a built-in closet. 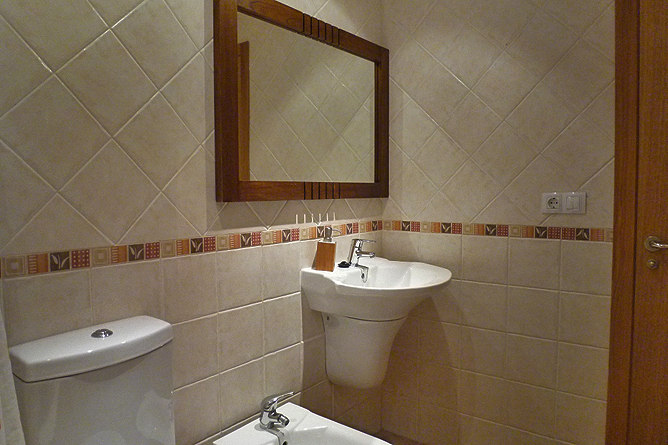 The bathroom has a bathtub, a bidet, a basin and a toilet. Glass sliding doors provide access to the balcony from the living room as well as from the bedroom. Even when lying in bed you enjoy a great sea view! bed linen and towels provided – please bring your own pool- and beach towels! 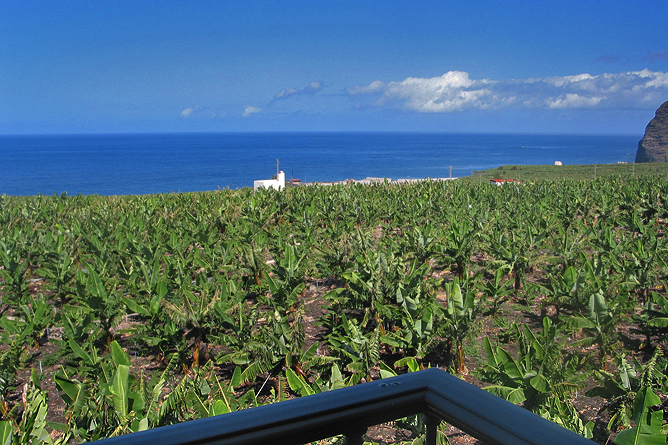 Apartment Luz de Palma with beautiful seaview is situated near the small town but at the same time in a rural surrounding with chickens and goats nearby. 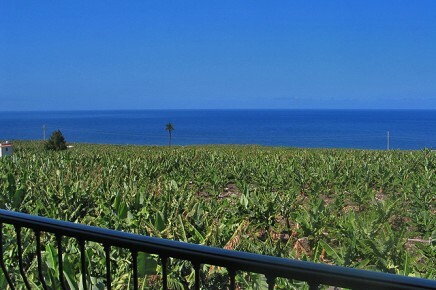 The picturesque town Tazacorte is located within a short walking distance. There you find various supermarkets and shops, a very good restaurant, the Carpe Diem, as well as bars and banks. On the Plaza in der centre, designed by Luis Morera, a popular artist of La Palma, you can order a “cortado” (coffee) or snack. 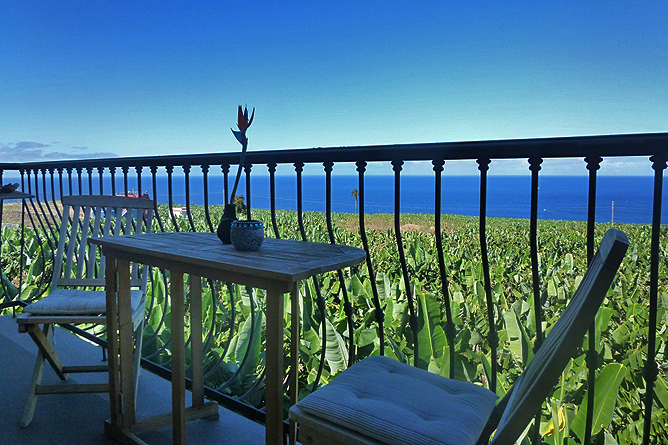 Villa de Tazacorte is a perfect starting point for activities and trips to the beach. Los Llanos, the biggest town on the west side is only a 8 minutes drive and offers a variety of shops, restaurants and bars. There is a good bus service close to the holiday apartment to the main terminal where buses leave to all parts of the island. Lovingly furnished Holiday Apartment on the Sunny Side of the Island.